The artists in this show offer a commentary on the role of the domestic object and its politicization in the field of Fiber Art. The work of Lou Cabeen pays homage to women's work by refocusing attention towards traditional linens or objects found in the home. 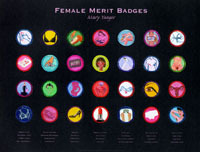 Mary Yaeger's female merit badges humorously describe the female experience in an iconographic format. Karen Hampton continues the stories of the struggle of generations of African-American women through her beautifully woven and embroidered pieces. 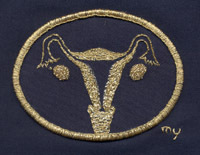 Linda Dolack, who will be showing at SOFA in Chicago, awes us with her expansive beadwork on pop cultural icons. Finally, Monica Sheets deconstructs the domestic context of everyday objects and reassigns them with the preciousness of museum specimens. The artists here open up a social dialogue concerning issues of feminism, gender roles, and domesticity. 41" x 41" x 24"
51" x 41" x 24"
54" x 28" x 4"
64" x 60" x 4"
50" x 50" x 30"
4" x 22" x 18"
27.5" x 17" x 20"
48" x 60" x 36"